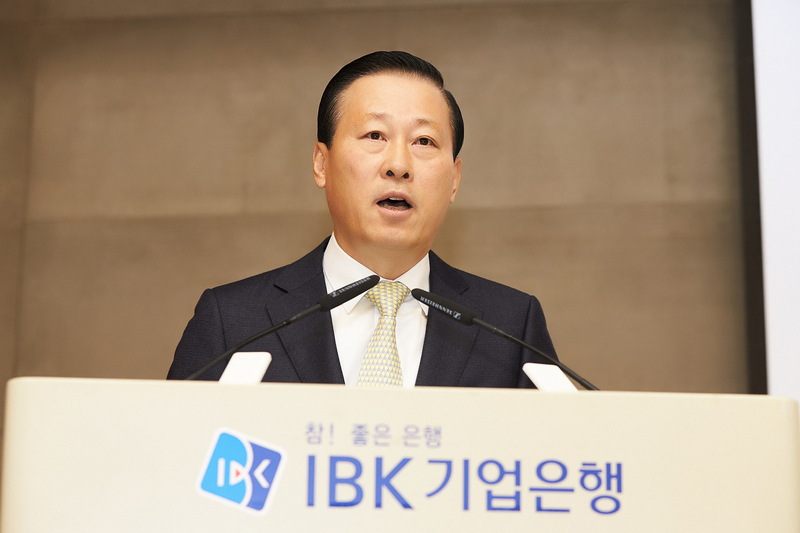 President Kim Do-jin, in his New Year’s address, said IBK should always be prepared to deal with uncertainty and potential danger, and pursue its responsibility as a state-owned bank. Part of that responsibility, he said, is to help SMEs and small business owners, provide financial support to business firms for reformed growth, so they can build an ecological structure for investment. He outlined the Industrial Bank of Korea’s targets for the new year at a ceremony at the IBK head office in Eulziro, downtown Seoul, on Jan. 2. He said optimization is the ultimate terminal for change and reform. Kim said the three major optimization tasks for the bank in the new year are: optimization of the bank’s business network; optimization of IBK’s corporate culture in line with changes in time; and the provision of the customer experience based on the optimized data. The IBK CEO also stressed ethical behavior and just management to win the respect of society, fellow employees and customers. He called for stout management of the bank’s healthy operation, the protection of financial information and safety of the bank’s frontline operation. The bank also held a declaration for the Human Rights Management at the New Year ceremony, which is designed to keep finance within the boundary of human right’s always accompanied by happiness and hope. Kim said his management policies will always be within the boundary of human rights, protecting human rights, respect for human rights, and the salvation of human violations, so the human rights of the officers and staff of the bank will always be honored. The CEO, who stressed the customers and the jobsites as the most important areas of his management from the beginning, will take time to travel to Tongyong, and Geoje Island, South Gyeongsang Province, located in the southernmost tip of the Korean peninsula this year, following his visit to a region in the Gangwon Province, last year. The Industrial Bank of Korea provides various banking products and services to individuals and corporate customers. The company operates through Retail Banking, Corporate Banking, Money Market, IB, and Others segments. It offers retail banking products and services, such as current and savings accounts, demand deposits, and retail and mortgage loans; corporate banking products and services comprising loans, overdrafts, and other credit facilities for private and public enterprises; money market services, including foreign currency, treasury, and investment related services; and smart, telephone, and Internet banking services. Products and services also include installment financing and venture capital, factoring; investment trust, asset management, consulting, and future funds management; loan collection and credit research; securities and futures trading; information system development and advisory; and microfinancing. The company operates approximately 571 branches and 38 depositary offices in Korea; and 11 overseas offices. Industrial Bank of Korea was founded in 1961 and is headquartered in Seoul, South Korea. IBK was established in 1961 pursuant to the Industrial Bank of Korea Act (the “IBK Act”) to promote independent economic activities and provide development finance and related banking services to small- and medium-sized enterprises in Korea, is a full-service commercial banking institution. IBK’s principal authority under the IBK Act is to discount bills for, and to make loans to, SMEs in a wide range of industries. Most of IBK’s activities have been carried out pursuant to this authority. However, in addition to IBK’s primary public purpose, IBK provides a broad range of banking services to individuals, households and other non-SMEs, including lending, deposit taking, credit card issuance and servicing, trust account management, and research and advisory services. 홈페이지와 콘텐트 저작권은 뉴스월드에 있습니다.